Here are the pictures with fired 7,62x51 blank. With the way the case mouth is… It was a blank fired in a G3 rifle. "MS == Ammunition Annexe (NOT Factory) at Salisbury (South Australia) in operation 1943-44 ONLY; Used for the Assembly of .303 Tracer Ammunition ONLY (NO Ball or other types,) Mark GII; of the several millions of rounds assembled in 1944, almost all lots “Failed proof” (The Tracer) for acceptance and were destroyed…surviving samples ( I have one, by pure chance) are like rocking-horse excreta. Some headstamps are “Ms” as well. Cases made by one of the other South Australian Plants (MH or MJ --N0.3 and 4, Hendon, SA). Even the “No. 7” indication may be erroneous, as No. 7 was supposedly assigned to a Tasmanian Plant, which assembled Cannon ( 20mm) ammo. Some of these “Data Base” Indexes should be cleaned up of such inaccuracies. Headstamps go with Dates…otherwise all sorts of problems arise. The Cartridge to be ID’d is definitely a Manusaar Product, and made specifically for a H&K tyupe Firearm ( ?G3?) given the resulting fluted chamber markings on profile and neck and shoulder. Also, the Case OAL is shorter than the usual “NATO” type extended Blank ( which is about 64-65mm Long Unloaded). This one looks about 57mm OAL…Maybe a case-overrun from 7,9x57 Production for sime other buyer outside Europe? or just a design quirk? I think the dates listed as 1957-1963 are not correct. 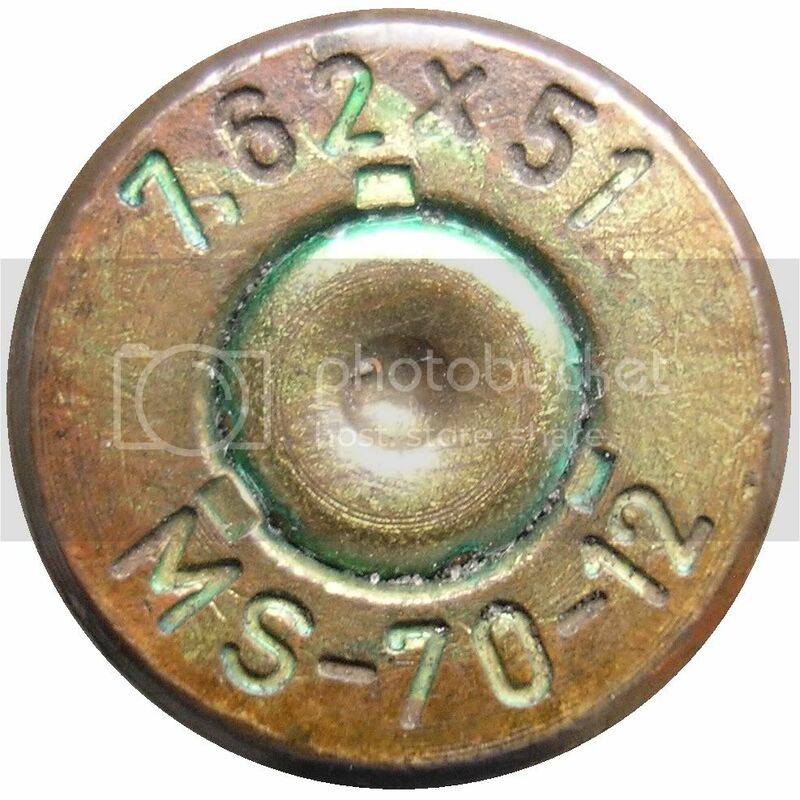 I have several headstamps of 7.62 x 51mm Manusaar cartridges with dates of 59, 63, 66, 67, 69, 70. I would suspect the company was in business until 1970/1971. I will look more in to this. As an aside, it is interesting to note that the cartridges made 1959-1967 I have, the headstamps are all displayed as MS-Lot- Year. The 1969 and 1970 (as the one on this post shows) the headstamps are displayed as MS -year-Lot. UPDATE: It appears 1973 is the end date, not 1963. Could somebody help me with exact Manusaar company name and city where it was in 1960-70s? These cartridges are not blanks, have a box of these cartridges. 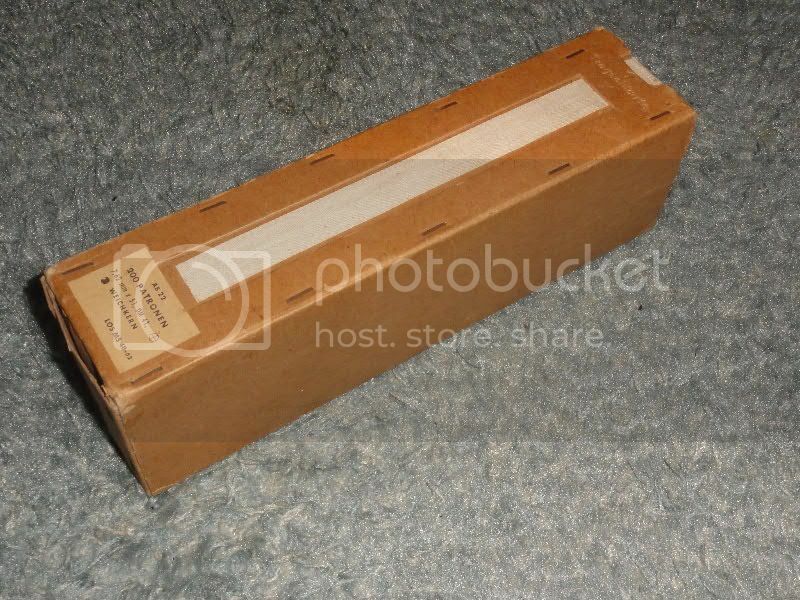 [quote=“JAN”]These cartridges are not blanks, have a box of these cartridges. I think that translates into Grenade launching?? Yesterday I asked a friend who is specialized in Manusaar. It was founded in 1953 with the attention to produce the US primer PD M 51 A 5 in Germany. In 1957 the first order for 160 Million rounds 7,62x51 Nato. They stopped the production in 1972. Reason, no more orders from the German government. On the old factory ground the city build a housing aria. Could you ask your friend the correct name of Manusaar factory and the place where it was? located at Büdingen, Federal Republic of Germany. White and Munhalls earlier Cartridge Headstamp Guide shows basically the same - Manusaar Büdingen, Büdingen, Hessen, FRG. A publication from the Dutch Royal Navy concerning manufacturer’s marks on ammunition and associated material shows “MS” as Manusaar AG (Diehl), Büdingen. There seems to be no doubt that the company was located at Büdingen, Federal Republic of Germany. Every source shows them there. The Dutch document is dated from 28 October 2003, long after the ammunition was made, so that alone could explain the slight difference in the Company name. Corporate names do sometimes change, sometimes quite often, when a principal in the firm leaves, or the Corporation is dissolved and reconstituted under new ownership/management. Some time ago I read on the Gun Zone website about a mysterious M14 blowup while using MS ammunition. 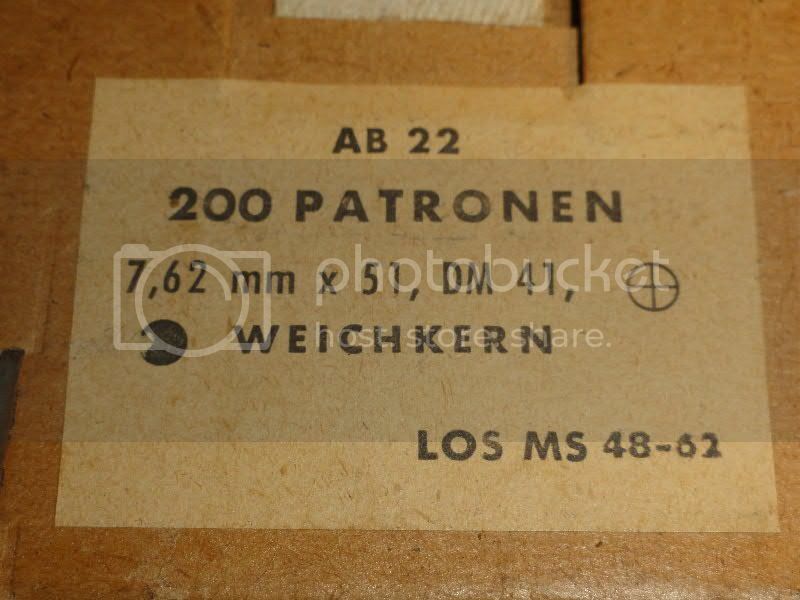 I found it at thegunzone.com/m1akb/762d2.html which has a picture of an MS ammunition box. Thank you, gyrojet! Great box! Manusaar was furnishing ammunition to the French government (it figures on the offcial listing of ammunition makers contracting with the French, and was also involved in research and development with light alloy cases, also in 7,62x51 Nato calibre in 1970. Hello gryojet, so your cartridges are in little 10 round cartons rather than the 20 round carton shown earlier.